Failure of Roux and Y gastric bypass (RYGB) is as high as 25%, it means that every forth patient is not loosing enough weight or gaining weight back. This number can reach 50% for patients with a BMI of 50 or more. Recent data showed that only Duodenal Switch (DS) is a successful revisional surgery for patient with past RYGB. Revision to DS can give a patient a chance to achieve BMI of 26 and loose 90 % of excess weight. These results are much better than original RYGB.For comparison data from MBSC showed that RYGB to RYGB revision is much less effective than primary operation with only 43 % of EWL. Many bariatric surgeons blamed patient for failed surgery but the fact is that surgery should be blamed for patient failure. International Federation For The Surgery Of Obesity meeting Istanbul 2013. Failure of Lap. Band (LB), not successful weight loss or weight regain after LB placement is as high as 50% for low BMI patients and as high as 80 % for high (more than 45 BMI) patients. Duodenal Switch (DS) is the most effective revisional bariatric surgery for LB patients. Revision of LB to DS can give patient a chance to loos 93% of Excess Weight (EWL) and reach BMI of 25.Revision of LB to any other restrictive procedure like Sleeve or VBG or even RYGB is not very successful. Failure of Sleeve, (not sufficient weight loss or weight regained) after sleeve is unavoidable. Just pass 5 years since Sleeve as a stay along surgery had been performed the first statistical data are showing that failure rate after this surgery can be quite high. As a restrictive surgery results would depend on BMI before surgery. Patient with a sleeve with a BMI above 50 or even 45 may not do well. Problems with Laparoscopic sleeve are related to calibration (volume) of the sleeve, which is not measured during the surgery and component of stretching what happened after this operation. According to recent data Duodenal Switch is the most successful revisional surgery for sleeve. Revision to RYGB doesn’t have any sense because is reversing the best restrictive procedure (sleeve) to completely unpredictable gastric by-pass. Adding band on sleeve goes with all possible complications related to Lap.Band. The only logical option is revision to Duodenal switch which can give patient a chance to loose 90% of excess weight with a BMI close to 24. A duodenal switch surgery is an alternative to gastric bypass surgery. It has been very successful in helping to reduce the side effects of gastric bypass surgery. Studies done in Europe have even proven it’s effectiveness on curing type 2 diabetes. Although studies are still being done so far this looks like a less evasive surgery compared to gastric bypass surgery. This surgery combines restrictive and malabsorption processes in order to meet the goal of weight loss. Duodenal Switch surgery involves removing 70% of your stomach around the curvature area this is the restrictive part of the surgery. The next step is the malabsorption part which involves rerouting a large section of your small intestines. This idea is to limit the amount of time your body has to absorb the fat and calories from the food in your intestines. Your body will only absorb about 20% of the fat it takes in, which in turn will help you lose weight. Since type 2 diabetes is significantly associated with obesity, having this operation will drastically reduce the body fat to allow the pancreas to work properly. With proper diet and exercise this is sometimes enough to help your body cure itself of type 2 diabetes. Know this process may not work in everyone because sometimes there are other factors for type 2 diabetes, but with a 98% effectiveness on many patients it is still a valid alternative. Because the Duodenal Switch surgery works on both the restrictive and malabsorption theory the weight loss is very rapid, which is very beneficial to the patient. Your diet for the duodenal switch surgery can return to fairly normal after the surgery with just a small adjustment in your vitamin and mineral intake. Recovery time is also shorter for the duodenal switch compared to the gastric bypass surgery. Weight Loss Surgery to Help Manage Diabetes? The United States has had a huge increase in obesity over the last 20 years. Doctors everywhere have seen their obese patient list increase. With the increase of obesity comes also the increase in type 2 diabetes in many children and adults. Everyone is trying to stress the need for healthier eating even in the schools, but sometimes to no avail. Some patients have chosen gastric bypass surgery as a way to help their obesity and some studies have shown that this has also had an effect on some patients type 2 diabetes. But is this really an option for everyone? Many weight loss surgeries have some serious risks involved with them. Depending on your doctor, you may not be a proper candidate for weight loss surgery. Weight loss surgery is meant as a last option for people who have tried everything else with no success. Type 2 diabetes can be controlled with other options which your doctor can recommend for you. But for those patients that are obese and the other options have not worked, then the weight loss surgery options might be looked into. There are several different types of weight loss surgery that have helped many patients in the past who are obese. This type of surgery is classified as a major surgery and will have certain side effects that you should be cautious of. But many studies done in Europe have found that this surgery can help to cure type 2 diabetes. The theory behind this surgery is restriction and malabsorption process. It help to restrict how much you eat and helps your body to not absorb fat. It is a fairly uncomplicated surgery as long as it performed by a physician who is familiar with the process and has done it before. The surgery basically makes a small pouch for your stomach to restrict your food intake. The malabsorption part comes from rerouting your small intestines to make the food move faster out of your system. That way your body cannot absorb the fat. This surgery has had a very positive effect for many patients. Always consult your doctor before you decide to do any type of surgery. And make sure that this is what you want to do, because this type of surgery is irreversible. Once you choose this type of surgery you will have to change your lifestyle forever. Many weight loss surgeries are very beneficial to obese patients, but not all patients are a good candidate for them. Consulting with your doctor on your options should be your first step to deciding a good course of care for you. People who suffer from dangerous levels of obesity now have many options available to them when it comes to losing some excess weight. In addition to strict exercise and diet there are some different medications you can try. When all else fails, there are various types of weight loss surgery, also known as bariatric surgery or gastric surgery. The most common of these procedures include: Gastric bypass surgery (stomach stapling); Gastric bands (limiting how much food you can eat); Intragastric balloon surgery (a balloon which is inflated inside the gastric area); Sleeve gastrectomy (actually reducing the size of the stomach to about 15% of its original size). All four of the above procedures operate on the principle of reducing the stomach size and thereby reducing the potential food intake. After your gastric surgery you will experience dramatic and rapid weight loss. In fact, during the first year you can expect to lose about 15 pounds per month. After this year it will decrease somewhat, however you can continue to lose more weight if you eat and exercise properly. The risk of heart disease will decrease, as will that of sleep apnea, bone disease and various other sicknesses. You should expect to have lower cholesterol levels and blood pressure. Just because you have undergone one of these surgeries does not mean that you can simply revert back to your previous lifestyle. You must receive post-surgical nutrition education and learn how to eat less. This can prove difficult in a modern world where we are otherwise encouraged to eat bigger portions. You should drink a full glass of water before each meal. This means you will get ‘full’ quicker and not likely to eat as much. Guidance will be available to you regarding balancing nutrition in every meal. You will learn about caloric intake and reading food labels. An important part of your weight loss program is to understand your own body’s propensity to put on weight with even minimal food intake. You are much more likely to succumb to deficiencies in iron and other vitamins. You should take supplements, especially ones containing iron and Vitamin B12 in order to avoid the risk of anaemia. Regular visits to your physician will ensure continuing progress long after the operation. You should engage in regular exercise following your bariatric surgery, under the guidance of a skilled fitness trainer who will design an individual program for you. It is important not to overdo weight loss exercise as it can be unhealthy to lose too much weight too quickly. Likewise you should not over engage in muscle increasing type exercise as this can increase your weight and cause you to be disillusioned. This is not a time to get depressed about these negative thoughts, but instead it should be a time to reflect on learning new lifestyle skills. Your overall sense of wellbeing will in fact be boosted and now you can enjoy the pleasures of eating healthily and the benefits of exercise. You will have a new lease on life! Obesity is the condition of being extremely overweight. Body weight is measured in relation to height in order to get the Body Mass Index, or BMI as it is more commonly known. BMI rates refer to your body weight in kilograms divided by height in meters (kg/m2). If your BMI is 25 or above then you are considered to be overweight, and if it is over 30 then you are obese. This measurement is not entirely accurate, as it does not take into consideration the percentage of fat in your body (for example a body builder may have a high BMI rate but not be obese) but it is a good general rule of thumb. Most often this medical condition is caused by overeating and lack of exercise in combination with certain genetic traits, however sometimes it is purely genetic. In these modern times people eat much more than they did last century, and the figures of the growing obesity rate reflect this. It is estimated that over a third of the adult population of America is obese. In 1980 this figure was only 14%. The advent of modern technology has also contributed to this, with people spending more time watching television or playing computer games. People depend on their cars to get them places now more than ever before, driving everywhere to run errands that used to involve exercise. Our lifestyles have become more sedentary in general. Apart from being unsightly, obesity causes a myriad of dangers to health. Among these are high blood pressure, diabetes, heart disease, sleep apnea and reduction of life expectancy. Obesity has also been linked to various types of cancer. In many cases obesity can be combated, a little at a time, with regular exercise and diet programs. An obese person who loses 10 – 15 pounds is doing himself or herself a huge favor. This generates encouragement and many people continue with losing a pound or two per week until they reach a more desirable weight. Some people, particularly those who are genetically obese, try and fail to lose weight with these conventional methods. There are a couple of different medications on the market, but these don’t work for everybody either. This is where bariatric surgery or weight loss surgery comes into play. The word ‘bariatric’ comes from the Greek ‘baros’ (meaning weight), and is used to describe weight loss surgery. There are various different types of this surgery or sub-genres if you like. The most common of these include gastric bypass surgery, gastric bands, gastric balloon surgery and sleeve gastrectomy. These are all proven to be effective, and different methods suit the needs of each individual. Insurance policies usually cover this for people with a BMI of over 40 and who have been unsuccessful in other methods of losing weight. After having taken the measures appropriate to an individual situation, there will be many improvements in lifestyle. Blood pressure becomes more stable, lethargy gives way to a feeling of energy and menial tasks can now be attacked with vigor. Sleep patterns can improve, and a general feeling of well-being pertains. Maybe you are one of the growing number of modern people who suffer from obesity. Perhaps you have tried overcoming this condition with physician-assisted dieting, exercise, even tried some of the new weight-loss drugs on the market. You have a BMI level of over 35. It could be time to consider one of the various types of gastric surgery that are available. What do you have to gain? What are the risks involved? In order to qualify for bariatric surgery you must fall between the ages of 18 and 60, with a BMI of usually over 40 but as low as thirty in some cases. You must have seriously tried to lose weight through all of the more traditional methods such as diet and exercise for a long period of time. Surgery for weight loss can be costly, somewhere in the region of US$15,000 – $35,000. The good news here is that if you really do need the surgery and have a physician’s recommendation then your insurance will probably cover it. This applies also to people on Medicare. Check with your insurance provider or Medicare for more details. The most obvious benefit of bariatric surgery is rapid weight loss. By undergoing these procedures you will also lower your risk of heart and bone disease, diabetes, sleep apnea and other symptoms which accompany being seriously overweight. Blood pressure will probably go down, as will cholesterol levels. Your tendencies towards depression or even suicide will decrease, and you may gain a new level of confidence with your slimmer figure. Like all surgeries, however, you must be prepared for the inherent risks. You .may have to remain in hospital after the procedure. You may develop allergic reactions to certain medicines. Diarrhea and bloating have been known to occur in post-gastric surgery patients. Hernias and pneumonia are also very rare after effects. The mortality rate is extremely low, with only 0.2% of people who have undergone bariatric surgery succumbing to death. It is suspected that these people went to physicians who were underqualified or underexperienced. A natural concern when considering which type of surgery to undergo would be whether the condition of obesity could possibly return in spite of the most diligent efforts at dieting, exercise etc. These are all matters which should be discussed individually and in detail with your surgeon before deciding to proceed. After having had any type of gastric surgery you are required to adhere to strict nutrition guidelines. You will be referred to a post-surgical nutrition education specialist who will design an individual program for you. You will need to learn to adapt your exercise program to keep a balance in your body mass. This would benefit from the support of a personal trainer, who can design and monitor your own exercise regime. This is probably best achieved by using the services of a local gymnasium. This may involve some heartache and work but can be worth the effort when you consider the massive improvement in your quality of life. Modern medicine and medical advances are simply on another level. Past years had limited medical solutions to the many health problems that people faced. At present, this gets to be an entirely different ball game. The medical fraternity has medical answers to a huge number of health ailment and other related issues. Take for instance the problem of being overweight. Modern medicine now provides obesity surgery as a means addressing this problem. Oakland Bariatrics has a team of doctors who specialize in this and offer various other surgical solutions. They offer gastric surgery, as a medical approach in surgery for weight loss. This will have a gastric bypass done to regulate you food intake. Bariatric surgery is also real modern answer to dealing with obesity. When it comes to doing surgery there is always the issue of cost and other underlying calls that go with it. That same will be evident if you do decide to go for a bariatric surgery. Therefore you should do some research on surgery for weight loss or you can as well simply seek the doctors advice about this issue. A gastric surgery will need you to be well prepared about having it for it to work effectively. If not, you will have spent a lot of money in doing a gastric bypass only to have it fail in accomplishing its purpose. You may, in some cases develop complication that will require you to get another surgery just to undo the bypass. So, get to have all the information when it concerns obesity surgery. With this issue running in the minds of many patients that visit the Oakland Bariatrics, the doctors know what to tell the patients with open discretions on possible outcomes. Just as any other surgical procedure the doctor will make sure, you are fully aware of what surgery for weight loss requires. You need to be ready both physically and mentally. Whether you go of a gastric bypass or a bariatric surgery, the result will be a regulated amount of food intake. The same will be if you go for a gastric surgery where banding is done. At the end of it, every type of obesity surgery done will limit that food you can consume and even the rate of consumption. Generally, what obesity surgery will center on is restriction. That means you will be limited on the kind of food to eat. You get to observe a certain kind of diet for some time and still stick a new one while minimizing on your former eating habits. A gastric bypass and a bariatric surgery are the best forms of surgery for weight loss done that have this limiting outcome. A gastric surgery done with banding is less demanding but it will still have the same dietary demands are the other forms of surgeries. If you do wish to get a surgery for weight loss done, then have it done in the hands of Oakland Bariatrics surgeons. No matter which obesity surgery you go for; be it a gastric surgery with a binding, a bariatric surgery or a gastric bypass, the doctors will take you through every step undertaken in the procedure. They will also advice you on other alternatives if you find that obesity surgery is not your cup of tea. You will find various kinds of surgical procedures for individuals who’re considering weight problems surgery. The methods that are mainly malabsorptive reduce how big the stomach by creating mal-absorption. There’s another complex operation that is known to as biliopancreatic diversion. This process is hardly carried out lately because of complications with malnourishment. Rather duodenal switch is carried out. Within this procedure, a more compact stomach is produced by re-secting area of the existing stomach. Through this process someone isn’t confronted with a limited component and for that reason can eat freely. When patients undergo laser hair removal, there’s part of the little intestine that is attached to a pouch. Very couple of patients faces a dietary deficiency which mandates that the procedure be corrected. However, while long lasting laser hair removal patients will need to take nutritional and vitamin minerals to be able to decrease any perils of inadequacies. With any quick weight loss, gall stones can cause a significant complication. Therefore, throughout this process, like many more, doctors will take away the gall bladder to avoid this risk. Individuals who don’t want to obtain their gall bladder removed may take recommended medicines to lessen the potential chance of gall stones after surgery. Should you undergo this surgical option you will then be needed to endure a lengthy-term follow-up for the diet. Once you receive your surgery and post-surgical nutrition education you can begin your study and learn that things such as why it is not healthy for patients to lose more than two or three pounds per week if they do need to lose weight and if they are shaping up and working on muscle mass, then this affect will be the opposite and they might see weight gain. By discouraging patients to weight themselves multiple times per day, they can begin to understand that real personal change will not happen overnight but rather a minimum of a month. America is a land where large portions are encouraged and the bigger, the better. However, teaching physical education provides the opportunity to teach patients that chewing their food for ten bites longer than they want will discourage large and unnecessary eating and that using smaller bowls and plates will encourage the appropriate portions. The body cannot lose weight if it is starved like most young girls think, nor can it lose weight if it is fed large portions only two times per day. When applying your surgery and post-surgical nutrition education in a home setting it is equally important to show patients that carbs except for vegetables should be avoided before they go to bed (since patients are prone to a midnight snack). After eating, patients should be encouraged to brush their teeth or chew mint or a piece of gum after, though not all homes allow gum chewing. By doing this, patients are able to tell their brain that they are full and no longer eating, otherwise the body will want seconds or additional desserts which are unnecessary. Telling patients to eat protein with each and every meal will encourage them to look beyond the caloric information of their food and to analyze what is a protein and how they can get the best amounts of each of the items on the nutrition table. They should be encouraged to walk around after they eat so that they can burn off extra calories. We are told that eating 100-calorie packs of cookies or other treats is permissible and healthy because it is the reduced-fat version. This is not true and patients should be informed that processed foods and sugars are not healthy. A lot of homes will serve a wide variety of cheap foods just like this during break times, and they are usually listed first or displayed at the front. This informs patients that this might be their only option, not realizing that every home has healthier options such as great fruits and vegetables available for snack times. Patients should not use condiments, even though they add a lot of flavor. These are really bad for you and we are taught that we can make anything taste good using them. It is important to show patients that the reasons they should be looking at labels is to see if they understand what they are consuming; if they cannot understand what is in their food then they should probably not be eating it. Teaching these nutrition concepts as a home nurse means showing patients that they cannot take on the world all at once, but rather, they should begin integrating health tips and physical fitness tips one at a time. They should not try more than two goals per week. This is turn teaches patients to slow down for long-term results. 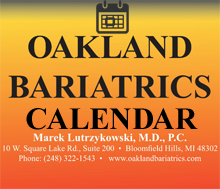 Copyright © 2016 Oakland Bariatrics | Surgery for Obesity. All Rights Reserved.